The John Orwell centre was a warehouse but is now a leisure centre. You can go weight training or circuit training at the Fitness gym or visit the Wild City organic cafe. There are indoor and outdoor courts where you can play badminton, basketball, volleyball, cricket or netball. If you or your group would like to try one of these sports then contact the centre and ask for a taster session. You can use the Fitness gym for taster sessions. A personal trainer can be there to support you. If you like it and want to use it more often you can get membership for a year. To do this you need to book an induction with a personal trainer. This means they help you work out what exercises are good for you to do. You can join fitness and exercise classes here. There are lots of different kinds like Yoga or circuit training. Call the centre to find out what is on offer. If you live in Tower Hamlets the staff here can support you to fill in a leisure pass form to get cheaper prices. All you need to bring is your ID and a passport photo. You can hire the centre for parties and family gatherings. John Orwell centre is a non-smoking area. If you want to use the centre as a group you should book tickets a week before you go. If you go at a peak time (when they are very busy) it is more expensive. and the evening (5.00 pm to 10.00 pm). Sunday morning (9.00 am to 2.30 pm). Off-peak times are cheaper because they are not so busy. and afternoon (2.00 pm to 5.00 pm). Saturday is off-peak all day. Sunday afternoon (2.30 pm to 6.30 pm). If you have a leisure pass it costs £1.80 to use the Gym at any time. it costs £4.80 to use the Gym at peak time and £3.90 at off-peak time. If you have a leisure pass it costs £1.70 at any time. If you don't have a leisure pass it costs about £4.70 at any time. 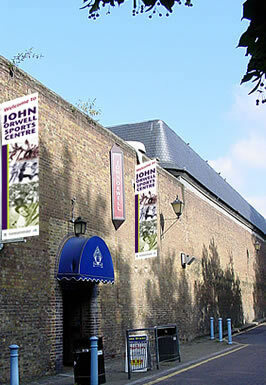 John Orwell centre is about 250 meters from the post office on Wapping Lane. It is behind the small park. Click here to see a map from Streetmap. There is accessible parking in the staff car-park on the right of the main entrance. The parking area is an uneven surface. You should let the centre know you need to park there so they can leave it unlocked. If you don't need disabled parking the main parking area is to the left of the main entrance. 100 and D3 are the nearest fully accessible buses. ((East London line) - Wapping underground station is about 480 metres from John Orwell Sports Centre. Wapping underground station is not accessible for wheelchair users. Wapping station has an accessible toilet in a unisex area. There is not a train station near to John Orwell Sports Centre. The main entrance has steps. The entrance doorway is 1260mm wide. Disabled access is through the staff and coach car park on the right side of the main entrance. It is best to take their phone number in case the car park is locked. The reception counter is visible from the main entrance. The outdoor courts are accessible for wheelchair users. There are 2 floors in the centre - the Ground floor and Floor 1. Floor 1 is not accessible for wheelchair users. This is where you find the reception, changing rooms, the gym and indoor courts. The reception has an accessible seating area. There are vending machines selling snacks. A coke and chips is about £1.40. A cup of tea is about 60p. There are lockers next to reception, they cost 20p to use. The gym is where you can do circuit training, weight training or exercises. Or you can enjoy sports in the indoor courts. This is where the Wild City organic café is. The food is very healthy and well priced. A bowl of soup with bread and cup of tea costs about £4.00. People with disabilities and groups should ask about concessions (cheaper prices). If it is difficult for you to get to Floor 1 the cafe staff can serve you in the reception area. There is also a viewing gallery, a massage and sun-bed room and a children's play area. These are on the Ground floor. The doorway to the changing rooms is 750mm wide. There is a 75mm step down into the shower block. There is a Men's changing room and a Ladies' changing room. The changing rooms have a toilet and a shared shower block. (We have only been able to check the Men's changing room). There are no accessible toilets at the centre. The toilets do not have hand rails and are not locked. The toilet doorway is 850mm wide. To get there you have to go through the changing rooms - the doorway is 750mm wide. TThe staff were really friendly and helpful on our visit. There are always members of staff who have first aid training.